Would like to transfer the forms to another user to manage. Both of us using Jotform. Possible to transfer, with all the database intact? You can easily transfer your form to a different account or even export it. There are similar questions which have been answered before. I quote it to save us time. 1. Copy the URL of the form you would like to transfer. 2. Log into the target account. 3. 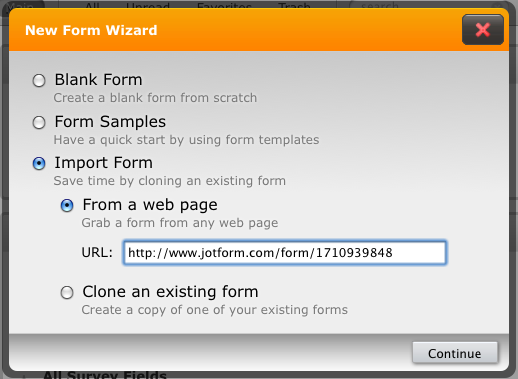 Click on "New Form" button on My Forms page. 4. Select "Import Form", then "From a web page". Then paste the URL. I hope that i could help you out. Here is a similar thread if you like to check out.